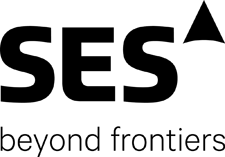 SES (Euronext Paris:SESG) (LuxX:SESG) has unveiled a new hybrid resiliency platform to serve the specific needs of telcos, mobile network operators, enterprises and maritime connectivity providers. Internet services provider Palau Telecoms is already enjoying the exceptional performance of the seamless solution supporting business continuity and profitability. The new solution represents fully-managed ‘bandwidth-on-demand’ connectivity, with intelligent routing and resiliency. Unique to SES, the multi-orbit approach, which leverages the wide coverage capabilities of GEOt satellites and the high throughput capabilities of MEO satellites, allows virtually 100 percent availability of services. 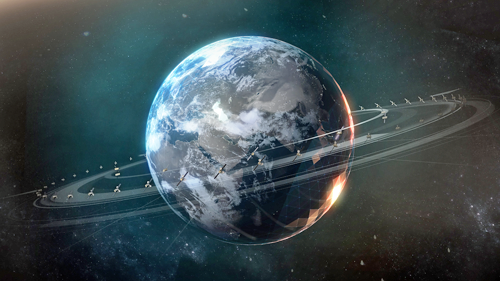 Artistic rendition of SES satellites on orbit. The fully managed solution is currently available in the APAC region and is provided though a platform equipped to support the most reliable and high performing networks across orbit-diverse connections. The service is planned for rollout across further regions and complements the site diversity intelligent routing capability that has already been successfully deployed for many SES Networks customers. SES has recently announced the company's new go-to-market organization model, which is comprised of highly customer-focused business units. Under the new model, the data-centric segments are served by SES Networks, allowing the firm to deliver increasingly differentiated satellite-enabled solutions for Fixed Data, Mobility, and Government. This hybrid resiliency platform represents a fine example of the power of combining the infrastructure, networks and operations available within the SES Networks business unit. Steve Collar, the CEO of SES Networks, stated that the company's multi-orbit approach allows for the catering of literally all connectivity needs of the firm's telco and enterprise customers, even in the most remote areas with no or limited terrestrial telecom infrastructure. Long-standing partner Palau Telecoms and their customers will be the first to avail themselves of the benefits of this new broadband platform. Over the past several years, continued growth in Internet and mobile use in Palau has been noted, and this solution will have a huge impact that quality connectivity makes on local businesses and the economy. Sam Masang, the CEO of Palau Telecoms, added that satellite network solutions are ideal to help the company meet the growing data demand in Palau and bridge the digital divide, as terrestrial infrastructures have limitations and, in some cases, are not possible to roll-out. With an Internet penetration rate of around 30 percent, SES helps this company to address Palau’s thirst for data and boost the economy. MEO-driven connectivity has already been empowering citizens and businesses over the past several years and now our firms is the first customer to avail of SES’s hybrid GEO-MEO network in this region of the world.